This was my birthday gift from my family. 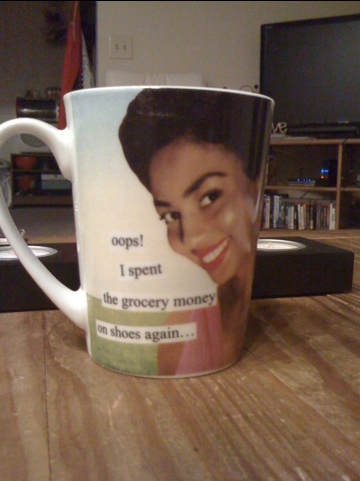 It encompasses some of my favorite things: shoes, shopping and coffee! Lovely! Funny part was, I was just pointing this mug out to Nate this past weekend as we were having lunch at the College Hill Coffee Company after church on Sunday. Good thing I controlled my purchasing impulses and didn’t buy it!